In 323 BC Alexander the Great, king of Macedonia, ruled a dominion that stretched from the Balkans to the Himalayas and from Egypt to the Caspian Sea. Possibly the most brilliant soldier in history, he had led a small and poorly equipped European army on a campaign of over 20,000 miles to conquer the mighty Persian Empire. Originally from Iran, the Persians held sway over a domain which also included all of what are now Turkey, Iraq, Afghanistan, Syria, Jordan, Israel and Egypt. It had taken him twelve years and he was still only thirty-two. Alexander the Great may have been the undisputed master of the world, but he was a slave to destiny. He did not die a warrior’s death in battle, but expired as helpless as a baby in his own bed. In the summer of that year Alexander had finished his conquest of the Persian Empire and returned to Babylon, the greatest city on earth. Situated on the banks of the River Euphrates, in what is now central Iraq, the city was to be the capital of his new empire. On the night of June 1, in chambers within the royal palace, Alexander was holding a memorial feast to honor the death of a close personal friend. Suddenly, around mid-evening, he was seized with intense pain and collapsed. He was taken to his bedchamber where, after ten days of agony, convulsions and delirium, he fell into a coma and died. 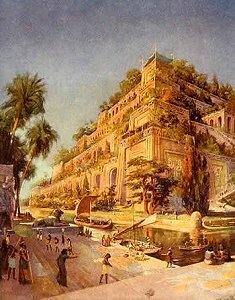 The Hanging Gardens of Babylon, perhaps the royal palace where Alexander held his last feast. For a map of Alexander’s empire as it was on his death in 323 BC, click >HERE. Unlike many events in ancient history, the details of Alexander’s death have been preserved. The initial symptoms were agitation, tremors, aching or stiffness in the neck, followed by a sudden, sharp pain in the area of the stomach. He then collapsed and suffered acute and excruciating agony wherever he was touched. Alexander also suffered from an intense thirst, fever and delirium, and throughout the night he experienced convulsions and hallucinations, followed by periods of calm. In the final stages of the condition he could not talk, although he could still move his head and arms. Ultimately, his breathing became difficult and he fell into a coma and died. Right: Alexander died in his bed of a mysteriously illness at the age of 32. The three popular theories concerning the cause of Alexander’s death – Malaria, typhoid and alcohol poisoning - can now be discounted. Malaria is carried by mosquitoes that live in jungle and tropical locations, but not in desert regions such as central Iraq where Alexander died. Two years earlier, Alexander had been in an area of India where malaria was common. Nevertheless, the disease cannot remain dormant for this period of time without producing symptoms. Alexander’s life from the time he was in India is well documented but there is no report whatsoever of a previous illness of this kind. Typhoid is transmitted by food or water contaminated by bacteria which causes epidemics and not just single, individual cases. There is nothing in any of the historical accounts to suggest such outbreak in Babylon at the time Alexander died. The main effect of alcohol poisoning is continual vomiting, but not once do any of the historical sources mention vomiting or even nausea as one of Alexander’s symptoms. One theory that has only recently been proposed is that Alexander died of an epidemic of the so-called West Nile Virus. Although a television documentary made the idea popular for a while, scientists soon pointed out that the virus is only a relatively recent disease that could not have infected someone over 2000 years ago. Click >HERE for further discussion of possible causes of Alexander’s death. So what did kill Alexander? 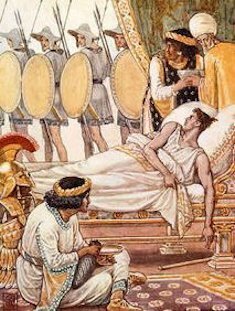 According to the historical accounts, Alexander’s body failed to show any signs of decay for six days after death, even though it was kept in a hot, sultry place. If Alexander’s body had remained preserved for this amount of time under the conditions described, somehow bacteria had been prevented from starting the process of decomposition. There could be only two causes: radiation, which could be discounted for the time, or a lethal does of a toxic substance that pervaded the corpse. The corpse’s state of preservation could only have been caused by large amounts of a toxic substance in the body’s system. 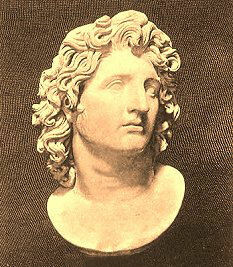 Alexander the Great had to have been poisoned. Click >HERE for the historical accounts of the strange preservation of Alexander’s body. 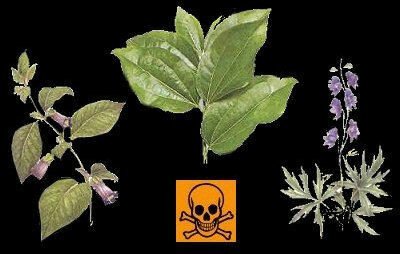 Belladonna, strychnine and aconite: three of the most poisonous plants in the world. One of these deadly alkaloid toxins was used to murder Alexander the Great. The only known poisons to produce the symptoms from which Alexander is recorded to have suffered are alkaloid vegetable toxins. Coming from plants, shrubs and trees, these nitrogen-bearing chemicals especially affect the nervous system, causing shaking limbs and muscle pains in the back or neck before the victim experiences severe agony and seizures. Most of the alkaloid poisons cause stomach pain, and many produce seizures, delirium and hallucinations; all of which are described in Alexander’s case. However, the list of poisons that could have killed Alexander can be shortened considerably because many of the alkaloid toxic plants also produce severe vomiting and intense headaches that are not reported. With the help of the Los Angeles County Regional Poison Centre at the University of Southern California, Graham eventually narrowed down the poisons to just one: strychnine, which comes from the fruit of the Nux Vomica tree. Click> HERE to compare the historical accounts of Alexander’s death with the symptoms of strychnine poisoning. The death of Alexander the Great is one of history’s most enduring mysteries. What caused the strong and healthy young ruler of half the known world to die so unexpectedly at the very height of his power? Historians have proposed malaria, typhoid and alcohol poisoning as possible causes of death. There have also been those who have suggested murder, but until now no one has seriously investigated the possibility.